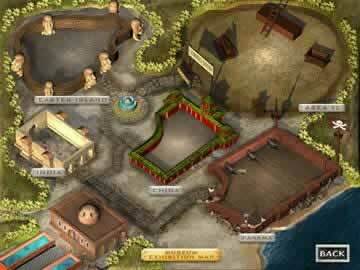 Tri-Peaks 2: Quest for the Ruby Ring Game Review - Download and Play Free Version! Unique 'Indiana Jones' type theme incorporated into everything makes the game entertaining. 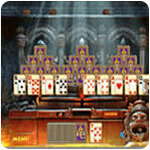 Different from traditional solitaire - quicker play, addictive, and for all ages. Several ways to earn score bonuses and powerups, making even the high levels playable my most players. Six hands per level with over 40 levels means hours of play time. Completing levels gives you lost relics (like trophies) to display in the museum and gloat over. Countdown of time left to save Ally doesn't stop for animations and you can't skip them. A Cursed Ruby Ring and a Mess of Traps! Tex and Ally are on a wild quest to find a cursed ruby ring before their rivals can. Can you help them escape from terrible traps and hunt down the ring? Venture through gorgeous sites in India, Easter Island, China and more on this thrilling solitaire quest! Tri-Peaks Solitaire With Fun Twists! This game features the strategic solitaire game Tri-Peaks but with fun twists. The goal of Tri-Peaks is to remove cards from the three peaks by clicking on cards on the peaks that are one number higher or lower than the face up card in the foundation deck. But keep strategy in mind or the card you need to complete the peak may have already been passed by! Try to get streaks of seven cards or more to earn rubies. The rubies are used in a mini game where you direct falling rubies into different cups worth different amounts of points. Every once in awhile, Ally will appear wrapped in ropes above a burning pit and beg you to clear a certain number of peaks in a small amount of time-talk about an adrenaline rush! A cute feature is watching Tex navigate through traps at the top of the screen. If you win the hand, Tex will dodge the fireball or jump over the spike, but if you don't win the hand, watch out! As he progresses, he will find treasure chests that may hold points, rubies or power-ups such as a score multiplier or a card that allows a face-up deal. Featuring one of the most addicting solitaire games out there, this game is sure to entertain anyone looking to practice their strategy or relax with a card game. The amazing audio and visual effects and the humorous characters add a charming factor to the traditional Tri-Peaks game. You can play Tri-Peaks without end because this game has great replay value and you'll want to return to the fun characters and clever twists time after time. This game features all the Tri-Peaks you can imagine and a great storyline-what more could you need for fun entertainment? Start playing now and enter the enjoyment! Players looking for a fun, engaging and addicting alternative to traditional solitaire games will have a blast with TriPeaks 2: Quest for the Ruby Ring. 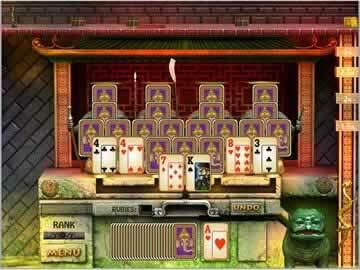 The Indiana Jones-esque storyline will entertain you while the deceptively simple gameplay captivates your attention and keeps you hooked, hand after hand, level after level. You will choose an avatar to play to help the eternally confused but lovable professor Tex and his quick-witted adventurer girlfriend Ally sift through ancient temples and clues to find the lost cursed ruby ring. With quality graphics, a great theme, and hours of card clicking fun, TriPeaks 2 is a great play for just about anyone. Unlike most traditional solitaire-type games, TriPeaks 2 generally arranges the cards face down into three triangles, called peaks. The bottom row of cards are face up, so you can see their values. At the bottom of the screen is a stack of face down cards next to a single face up card. The card that faces up is a starter card, and the goal is to clear all the cards from the peaks by clicking on cards that are either directly above or below the start card in value. For example, if the starter card is a Jack, a player could either click on a Queen or a 10, regardless of suit, to continue. If there are no more cards that can be cleared with a particular starter card, the player can then click on the face down stack to be given another starter card and continue clearing. There are a limited number of cards in the stack, however, and many of them may not help clear any cards at all, so the player must be careful in their choices in order to clear as many cards as possible using as little starter cards as possible. This makes what initially seems like a relatively simple game rather challenging. You can earn bonuses for the more cards you are able to clear without clicking on the stack. Once you clear five cards in a row, a counter begins to show your current streak. A seven card streak will earn you a ruby to be used in a bonus game. These streaks also help you gain a score multiplier, which is shown on a pole on the side of the screen, with a little animal climbing towards the 1.5x, 2x, 2.5x and 3x score multipliers respectively. Each card cleared is a step up the pole, while each card used from the stack is a step down. The ultimate goal of the game is to get a high score and post it on the global score board, and score multipliers help immensely with this. The other way to earn bonuses is by collecting rubies. These are earned by clearing seven cards in a row or gotten from treasure chests (more on these in a minute). The rubies are used in a randomly generated bonus game. Basically it's a version of Plinko, where the rubies are dropped from the top and you must maneuver a row of pegs (like Foosball) to get the rubies to fall into the higher value cups. The highest scores are gained by getting all the rubies to fall into the 50 point cup. There are over 40 levels of TriPeaks fun, each filled with six hands of play. This means you must beat at least six TriPeaks hands to beat each level, making it a game that literally has hours of play time. Tex is situated at the top of the screen, and his movement shows your progress during the level. There are obstacles and traps for him to avoid, but of course he can't navigate them without your help. Each time you beat a hand, Tex moves past one trap; each time you fail, he gets caught by it. The animations are hilarious, ranging from Tex getting hit in the head with a boomerang or crushed by a giant stone Easter Island head. There are four treasure chests per level, which Tex reaches as you beat hands. They yield either points, rubies, or powerups. The final chest usually gives a lost relic to be placed in your museum, indicating that you have beaten the level, or if the game deems you unworthy, just points. This means you have to beat another six hands and hope the last chest gives you the relic. The relics themselves are also very funny, and include things like an Ancient Spartans Abs Cruncher and the Mayan “Joke a Day” Desk Calendar. You can return to the museum whenever you want to view the relics and gloat over your TriPeaks prowess! Another interesting feature to the game is Ally. Every so often, she will be caught in a booby trap. She hangs on the side of the screen, slowly dropping towards some horrific fate like quicksand, and you have three minutes to clear five peaks if you want to save her! This adds an intensity element that is lacking in the rest of the game, because it is the only instance in which you are under time constraints. You don't get any penalties for not saving Ally in time, but you get a bonus if you do. This makes the change in pace a lot of fun, because it's not totally critical if you don't save her. (Don't worry, she doesn't die, just gets mad at you for letting her fall into the trap). Unfortunately this is also a drawback to the game, because the countdown timer to save Ally doesn't stop for anything, not even the animations or beating the hand. This can be frustrating if you have thirty seconds to clear two more peaks and Tex is wasting all your time being stabbed by a Terra Cotta soldier. The graphics, music and theme are all incredibly well done. You travel to four locations world wide, and the literally everything changes when you move. In China, the statues covered by the peaks are Terra Cotta warriors, while on Easter Island they are Easter Island stone heads. Even the little creature running up the pole towards your score multipliers changes from a monkey to a lizard and so on. The music is great and follows the location changes, playing Indian-inspired music while in India, Chinese music while in China, etc. The adventure/Indiana Jones theme is carried through to every aspect of the game, making it all very cohesive with the storyline and a lot of fun to play. TriPeaks 2: Quest for the Ruby Ring is a very well done game in general, but stands out especially in the card games genre. The theme, graphics and music all work very well together, creating an intriguing and interesting atmosphere for the game. The gameplay itself is easy to learn but still has hidden difficulties, making it a constant challenge for any player. Anyone can, and will, enjoy TriPeaks 2, so download it now and get hooked yourself! Watch gameplay footage featuring the fast-paced card action to be found in this continent hopping quest for the ruby ring.